The science process skill is important for teachers. However, not all of the student teachers have the competency, experience, and passion to science. The students of PGSD UKSW come from many kinds of background of middle schools that makes them have some different experiences in science competencies. The specific identification is needed to compare their science understanding/ comprehension. Their daily menu (diet) is the proper way to identify the students’ science understanding, because it is an activity that all people have done. The purpose of this research is to identify the students’ science comprehension through daily consumption patterns based on Home Science Process Skill (HSPS), modified from the science process skill steps used at home. HSPS has some advantages, as it makes the student enjoy their science learning and find the basic of knowledge from daily life. The survey methodology was used to find detailed facts about the level of science understanding. The data triangulation were gathered through questionnaires, interviews, and observations, that describe HSPS indicators, consisting of: scrutiny, note down, try out, create, tell (cermati, catat, coba, cipta, cerita). The results showed that 74.07% of the students encounter difficulty especially in the create phase, in which they have to try and create scientific products. It was also found that the highest difficulty was at the the try out and create phase. Thus, the level of student science understanding is still low. The conclusion is an initial stage of an action research to increase every HSPS indicators achievements. Adom, Dickson., Adam, Saeed., Agyemang, Osafo. 2016. Effective Instructional Methods and Strategies for Teaching Art History. International Journal of Art and Art History, 4(2), 45-62. Airlanda, G.S. 2016. Pengembangan Modul Pembelajaran Biologi Berbasis HSPS Dipadukan Blended Learning untuk Meningkatkan Keterampilan Proses Sains Siswa IPA SMA Kristen Petra Malang. Jurnal Pendidikan Sains Volume 4(1), 1-8. Asyhari & Clara. 2017. Pengaruh Pembelajaran Levels of Inquiry Terhadap Kemampuan Literasi Sains Siswa. Jurnal Scientiae Educatia: Jurnal Pendidikan Sains, Vol 6 (2), 87-101. Atmojo, S.E. 2012. Profil Keterampilan Proses Sains dan Apresiasi Siswa Terhadap Pengrajin Tempe dalam Pembelajaran IPA Berpendekatan Etnosains. Jurnal Pendidikan IPA Indonesia, 1(2), 115-122. Dahar, R.W., 1985. Kesiapan Guru Mengajarkan Sains di Sekolah Dasar ditinjau dari Segi Pengembangan Keterampilan Proses Sains (Suatu Iluminatif tentang Proses Belajar Mengajar Sains di Kelas 4, 5 dan 6 Sekolah Dasar). Disertasi Doktor. Bandung: FPS IKIP Bandung. Tidak diterbitkan. Department of Education Australia. 2017. Exploring Science Technology, Engineering and Mathematic at Home. Government of Western Australia, Public Education A World of Opportunities. SCIS NO: 1831078. Dimyati, M. 2006. Belajar dan Pembelajaran. Jakarta: Departemen Pendidikan dan Kebudayaan. Faulkner & Latham. (2016). Adventurous Lives: Teacher Qualities for 21st Century Learning. Australian Journal of Teacher Education, Vol 41 (4), 136-150. Fitriani, Andhin., Mulyasari, Effy., Prabawa., Kamia. 2016. Developing Thematic Teaching Materials: Their Implementation in Project-Based Learning at Elementary Level. International Journal of Control Theory and Applications, 9 (35). Franco, Lara., Shanahan, Danielle., Fuller, Richard. 2017. A Review of the Benefits of Nature Experiences: More Than Meets the Eye. Journal of Environtmental Research and Public Health, Vol 14 (846), 1-29. Irwanto., Rohaeti, Eli., Widjajanti, Endang., Suyanta. 2017. Students’ Science Process Skill and Analytical Thinking Ability in Chemistry Learning. The 4th International Conference on Research, Implementation, and Education of Mathematics and Science (4th ICRIEMS). Isdaryanti, B., Rachman, M., Sukestiyarno., Florentinus, T., Widodo. (2018). Teachers’ Performance in Science Learning Management Integrated with Character Education. 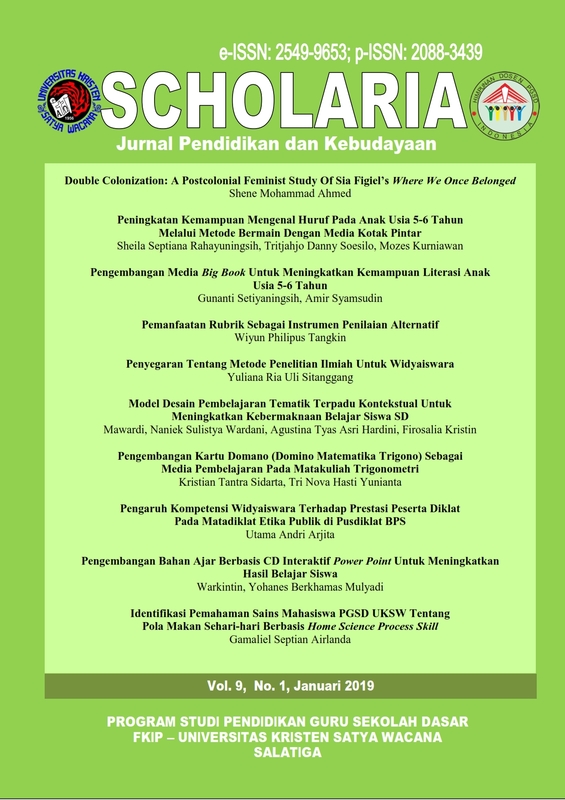 Jurnal Pendidikan IPA Indonesia, JPII 7 (1), 9-15. Istijabatun, S. 2013. Pengaruh Pengetahuan Alam Terhadap Pemahaman Mata Pelajaran Kimia. Jurnal Inovasi Pendidikan Kimia, Volume 2 No.2 halaman 323-329. Kizlik, B. 2016. Instructional Methods Information (Part 1). Robert Kizlik & Associates, Florida: Boca Raton. (online) (http://www.adprima.com/teachmeth.htm.) diakses 1 Oktober 2018. Koretsky, M. D., Christine, K., & Gummer, E. 2011. Student Perceptions of Learning in the Laboratory: Comparison of Industrially Situated Virtual Laboratories to Capstone Physical Laboratories. Journal of Engineering Education, 100(3), 540–573. Kurniawan, A. 2016. Profil Penguasaan Keterampilan Proses Sains Mahasiswa Program Pendidikan Guru Sekolah Dasar Universitas Terbuka. Prosiding Seminar Nasional Biologi, Sains dan Lingkungannya, 13(1), 410-419. Lederman, N.G, Lederman, J.S & Antink, A. 2013. Nature of Science and Scientific Inquiry as Context for the Learning of Science and Achievement of Scientific Literacy. International Journal of Education in Mathematics, Science and Technology (IJEMST), 1(3), 138-147. Lu’Lu, S. 2016. Improving Students Science Process Skills on Biology using Bounded Inquiry Lab Model. Jurnal Bioedukasi, 9(2), 49-54. Maknun, D., Surtikanti, H. 2012. Keterampilan Esenssial dan Kompetensi Motorik Laboratorium Mahasiswa Calon Guru Biologi dalam Kegiatan Praktikum Biologi. Jurnal Pendidikan IPA Indonesia, 1(2), 141-148. Permendiknas Nomor 16 Tahun 2007. Standar Kualifikasi Akademik dan Kompetensi Guru. Kementerian Pendidikan dan Kebudayaan. (online), (http://vervalsp.data.kemdikbud.go.id/ prosespembelajaran/file/Permendiknas%20No%2016%20Tahun%202007.pdf). (online). Diakses 6 Januari 2018. Rauf, Abd Rose., Rasul, Sattar.,Mansor, Azlin., Othman., Lydon. 2013. Inculcation of Science Process Skills in a Science Classroom. Canadian Center of Science and Education. Journal of Asian Social Science, 9(8), 46-57. Risch, M. 2014. Investigation about representations used in teaching to prevent misconceptions regarding inverse proportionality. Journal of STEM Education, 1(4), 2-7. Rustaman, N. 2011. Pendidikan dan Penelitian Sains dalam Mengembangkan Keterampilan Berpikir Tingkat Tinggi untuk Pembangunan Karakter. Prosiding Seminar Nasional Biologi, 8(1). Sa’idah, N. 2010. Peningkatan Pemahaman Konsep-konsep IPA melalui Pendekatan Contextual Teaching and Learning pada Siswa Kelas V SD Negeri Sondakan No 11 Surakarta Tahun pelajaran 2009/2010. Universitas Sebelas Maret: Surakarta. Suciati. 2011. Tugas Rumah Berbasis Home Science Process Skill (HSPS) pada Pembelajaran Biologi untuk Mengembangkan Literasi Sains Siswa. Prosiding Seminar Nasional VIII Pendidikan Biologi, 8(1), 253-260. Susilawati., Wijayanto., Khoiri, N., Masturi., Xaphakdy. 2018. LEARNING EXPERIENCE OF PRE-SERVICE PHYSICS TEACHERS IN DEVELOPING SIMPLE PROJECT LOADED BY LIFE SKILLS. Jurnal Pendidikan IPA Indonesia, JPII 7(1), 122-129. UNESCO. 2015. Quality Science Education and 21st-Century Skills. http://webarchive.unesco.org/20160930040522/ (online). Diakses pada tanggal 9 Desember 2017. Viel, C., Rodrigues., Melo, E., Bueno., Pimentel, M. 2014. Interaction with a Problem Solving Multi Video Lecture: Observing Students from Distance and Traditional Learning Courses. International Journal of Emerging Technologies in Learning, 9(1), 39-46. Voronov, V.K., Grechneva, M.V & Gerashchenko, L.A. 2013. The Program of Lecture Course “Consepts of Modern Natural Sciences. American Journal of Educational Research, 1(8), 344-349. Widiantono, Nugroho & Harjono, Nyoto. 2017. Penerapan Model Pembelajaran Interaktif untuk Meningkatkan Aktivitas dan Hasil Belajar IPA Siswa Kelas 5 SD. Scolaria: Jurnal Pendidikan dan Kebudayaan, 7(3), 199-213.